The free plugin acts as the foundation for the Premium versions, so everyone must follow this step. As the free plugin is hosted on the WordPress.org repository it can easily be installed right from your backend. 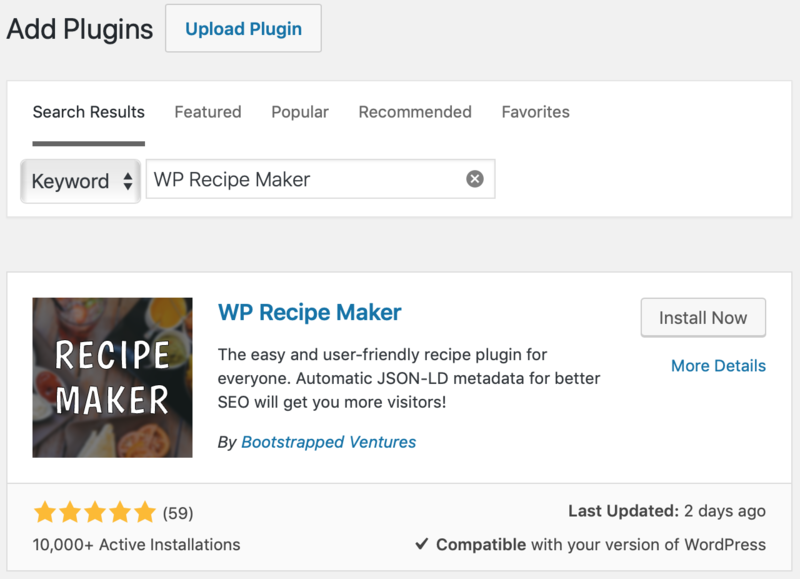 Just go to the Plugins > Add New page, search for "WP Recipe Maker", click on the "Install Now" button first and the "Activate" button next. Alternatively, download the plugin from the repository and install it just like the Premium plugin. Before you can install the Premium, Pro or Elite Bundle you will have to delete any existing WP Recipe Maker Premium, Pro or Elite Bundle plugins on your website. This can happen when upgrading from Premium to Pro, for example. Go to the Plugins page in your backend, deactivate first and delete the existing plugin as well. You will NOT lose any recipes or other data by doing this, even though you'll get a warning message for that. If you don't deactivate AND delete you'll get an error when trying to install the new plugin file. Make sure you've installed the free WP Recipe Maker plugin and removed any existing paid plugin, as explained above. After purchasing the plugin you'll receive an email with a download link for the plugin file. Another option is to download the plugin file from your account page. Check if you have a .zip file archive of the plugin after the download. If not, follow these instructions to get a zip archive. The plugin can be installed by going to the Plugins > Add New page (like you did with the free plugin) and then clicking on the "Upload Plugin" button near the top. Click on "Choose File" to select the plugin zip file, then "Install Now" and "Activate".